Please note: this a true life story and the contributor wishes to remain anonymous. 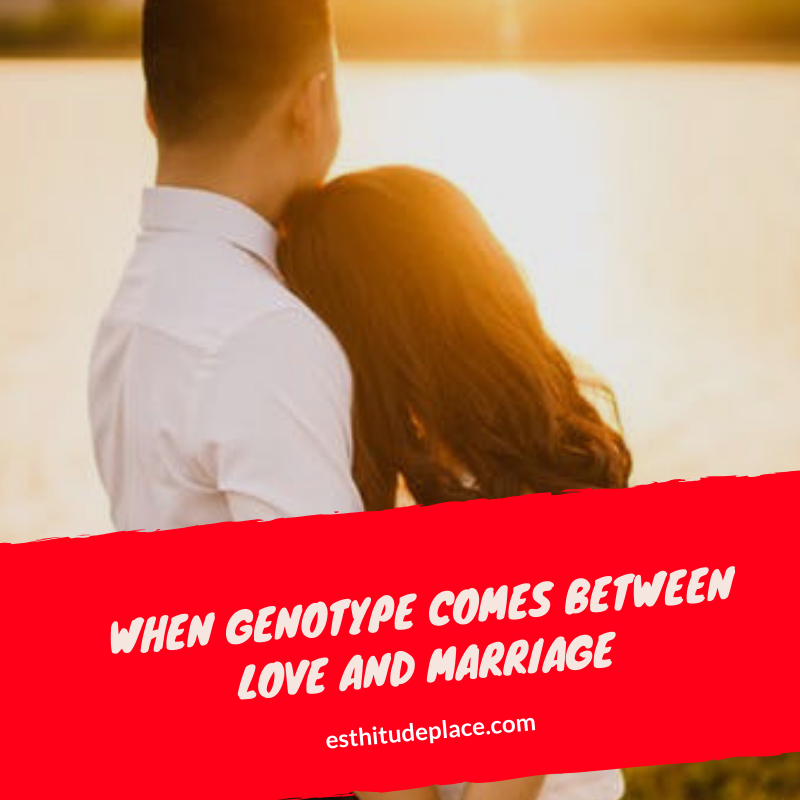 “You are strongly advised not to go ahead with the relationship for no other reason for now than genotype incompatibility”. That emphatic but “empathetically” said statement reduced from fifty percent to zero percent, the possibility of what I had anticipated might be a great and understanding relationship. I left my counselors beaming with a faked smile while countless thoughts ran through my mind. I could sense some worries and anxieties announcing their arrivals despite initial preparations through affirmations and my cherished principle of being in control of my happiness. I had just known my genotype few months before an attempt to start a journey into marital bliss, I had never cared before, no thanks to late medical registrations in schools, busy schedules while in National Youth Service camp, infrequent if not none existent hospital checkups due to “sound health”. Several questions, one after another. I managed to contain the usual questions the adversary is known for popping in minds to prevent casting away my confidence. I would probably have preferred her “no” to this statement. Love is indeed stronger than death, much stronger if you have patiently waited long for it defiling all odds. People in love have defied so many odds to achieve their dream relationship – disability of partners, non-consent from people who have influence over them, age difference, racial difference, non-consent from parents because of difference in belief, non-consent of friends and respected ones, etc. The advent of medical science, in an attempt to solve a problem has added another one – Genotype Compatibility. It’s still a mystery why what man does not have control over should be so important a factor as to threaten many promising relationships where other compatibility issues are near hundred percent passed if not totally passed. The question has always been if it is worth it to sacrifice a good relationship for chances of the wellness of an unborn child. The reason why many people avoid the discussion of genotype before marriage. I will spare you the scientific jargons. Your genotype is your complete heritable genetic identity. Apart from how you look, talk and your blood group, your genotype (hemoglobin/red blood cell gene) is one of those things also passed to you from your parents. So, you didn’t choose your genotype just as you didn’t choose how you look when you were born. These cells are in pair in the body, you get one from your dad and the other one from your mum when you are born but you don’t have power to choose the one you like. After all you were powerless in the womb. When you get marry too, and you start having children, the same process repeat itself. That is how God has created it. Hemoglobin cell (the cells that produces the blood running in your blood vessels) type can be A, C or S. While A is considered to be normal, S and C are considered to be defective hemoglobin cells. Thus AA has a pair of normal hemoglobin cells, AS and AC have a pair consisting of a normal hemoglobin cell and a defective hemoglobin cell, SS and SC have a pair of both defective hemoglobin cells. SS cells are sickle cell anemic also known as Sickle Cell Disorder (SCD). SCD patients are predominantly African or people of African origin. AS and AC are healthy carriers. It means they are healthy but if they marry each other, there is one chance in four that their children can get one defected hemoglobin cell from the father and another defected hemoglobin cell from the mother leading to SCD. Similarly, AS and SS have one in two chances of each contributing a defected hemoglobin to each of their children. • AA can marry any genotype. A word of caution here:- Gone are those days when sickle cell anemia was like a death sentence. According to World Health Organization, the average life expectancy a sickle cell anemia patient in the United State has increased from below 20 years to about 63 years while the average life expectancy of the average person in Nigeria is 50 years. Success stories of SCD patients who have not allowed the challenge to define them and who doing well in their chosen fields in Nigeria and African have confirmed this. However, the goal of WHO is to eradicate this blood disorder because of the associated pains and needed care. It is expected that gene therapy, which holds promise for the cure will be affordable for the common man in the near future. Despite the glimpses of hope for SCD patients, society counts it as selfishness aided by love on the part of any intending couple who despite knowing that they are carriers still go ahead to exchange marital vow. As a matter of fact, Kaduna state government in 2016 passed into law the pre-marital medical examination bill which makes it illegal to marry without undergoing medical screening. First, know your genotype – Even with the level of education in Nigeria, an average Nigerian youth does not know his genotype. If your genotype is AA as explained above, this may not be a call to action than to be your brother’s keeper, tell your friend to know her genotype before him/her “falls in love”. For those who are already love birds and later discover their genotypes, romantic love can be intoxicating with emotions clouding decisions, however, in matters like this, you have to gravitate towards deeper, mature love with mutual understanding of what is at stake. Yes, you love her, do you love her future? Do you love her ambitions and visions? Will she be able to fulfill her life purpose if you decide to go ahead? Do you love those children even though they are yet unborn? And for people of faith, have you sought the counsel of more matured men of faith who are detached from your emotions? Have you really prayed and you are convinced beyond doubts before assuming God wants you to go ahead? If the questions are all sorted, who can resist your choice? There are stories of carrier couple who never gave birth to sickle cell anemic patients but there are also situations where love did not “conquer all”. To married couples who are in this situation either ignorantly or deliberately, consult the right medical personnel before you believe all the myths scattered over the internet. The God who knows the composition of every man has not changed. Just have a relationship with Him and he will see you through. First, is gene therapy for children through bone marrow transplant when SCD is discovered. The child undergoes bone marrow transplant at early stage in life. There have been success stories recorded in Nigeria but with big financial implication for the common man. Medically, this is still the only promising permanent cure for sickle cell. Another option some people go for is pregnancy diagnosis and possibly abortion. This blog teaches you about wholesome living and will never encourage this for those who fear God, because God frowns at killings. The pregnancy is diagnosed at early stage and the baby aborted if found to be sickle cell anemic, but why will a baby in the womb be killed because of his genotype? The third is adoption option. This is never a welcomed option for an average African parent. However, some people believe a good relationship is more important than children. If there is already a condition that will necessitate adoption or discussion for adoption instead of child bearing between the intending partners, why worry about the genotype of a child that will never be born? No matter your genotype, it was never your fault, you didn’t choose it. You were uniquely and wonderfully made and everything needed to complete your uniqueness has been made provision for, even when it’s difficult to believe it. God knew you before you were born. You just need to have a relationship with Him today. In a world where the blind has ruled the sighted and seeing, the cripple has borne the able bodied and “the weak” has ruled “the strong”, anxiousness over your genotype which you have no control over is a waste of time. Whatever great relationship you feel you have lost because of this is not lost. You will definitely be alright because you are not inferior to any man. Just go and fulfill God’s purpose which is the ultimate, the rest will fall in place. This is enlightening. Thank you for sharing.